Article by Charlotte Buckton (Position) and Karin Ness (Community Development / Community Legal Education Office), Northern Rivers Community Legal Centre. Early independent legal advice in child protection matters is crucial to helping parents explore their options to prevent permanent child removal. A review of Children’s Court documents for clients presenting at Northern Rivers Community Legal Centre (NRCLC) for advice after their children have been removed often reveals points within the process where early intervention legal advice could have provided the client with the opportunity to prevent their children being removed. Advise clients about options for avoiding a care application being made in the Children’s Court, including making an application in the Federal Circuit Court for Family Law Orders. 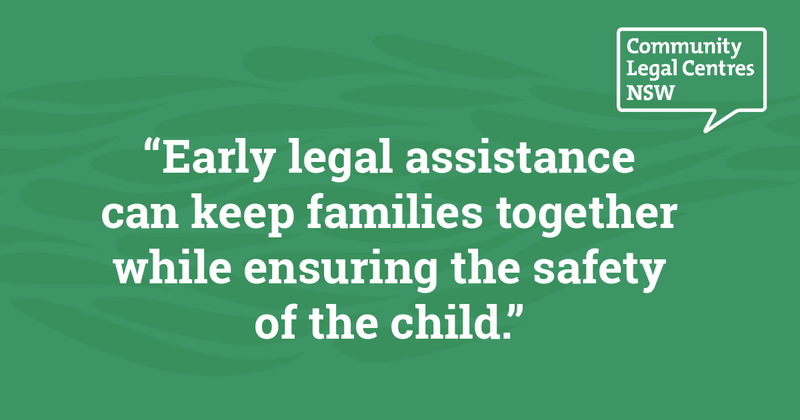 In short, early legal assistance can keep families together while ensuring the safety of the child. Our clients often have a history of negative interactions with FACS or at least a negative perception of FACS. This can limit the engagement clients have with FACS or prevent clients from taking in the information provided by FACS caseworkers. Having a solicitor provide this information to the client instead can help clients avoid a trigger response when communicating with FACS directly. Underpinning the Safe Home for Life changes to child protection, which elevated adoption and guardianship in the hierarchy of child placements, was the use of early intervention mechanisms including access to early intervention legal services. Unfortunately, FACS allocated only a small amount of funding to community legal centre’s for this purpose. Even despite this minimal funding alloaction, legal services continue to receive a lack of referrals from FACS in relation to early intervention matters. Our sector recommends that, for the benefit of children, parents and families, FACS workers be obliged to refer parents to legal assistance services at first contact. Legal services in the Northern Rivers region have reported that they often see clients for the first time when they require representation in the Children’s Court. Community service and health workers in this regard are the crucial link to accessing justice for clients presenting with child protection and domestic violence issues. The problem is that community service workers do not generally have the tools to identify a legal issue, access appropriate referral pathways for legal advice and also be able to effectively identify and address the barriers that clients have in accessing early intervention legal advice. 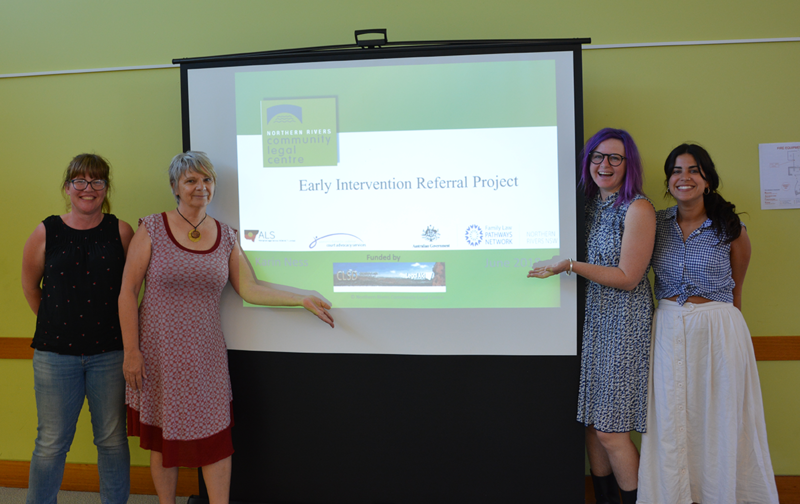 To address and overcome the lack of referrals made by FACS for early legal assistance, Northern Rivers Community Legal Centre partnered with a range of community services working with families experiencing FACS intervention to create the child protection Early Intervention Referral Project. The aim of the Project is to provide sector development for frontline service workers across the Northern Rivers region to guide effective responses to child protection and domestic and family violence presentations, with an emphasis on early referral to legal services and specialist domestic violence services. Above: The EIRP session in Yamba with Meg Bennet, Karin Ness, Charlotte Buckton, and Jo Collautti. Ongoing legal education workshops/seminars for service providers and community members, with a focus on explaining why it is important for service providers to refer clients for independent legal advice as soon as FACS become involved with a particular family, as well as helping us understand and address the barriers that people have in accessing early intervention legal advice. Referral map: detailing the stages of FACS intervention prior to children’s court proceedings being initiated and the reasons why it is important to refer clients for legal advice at each of these stages. 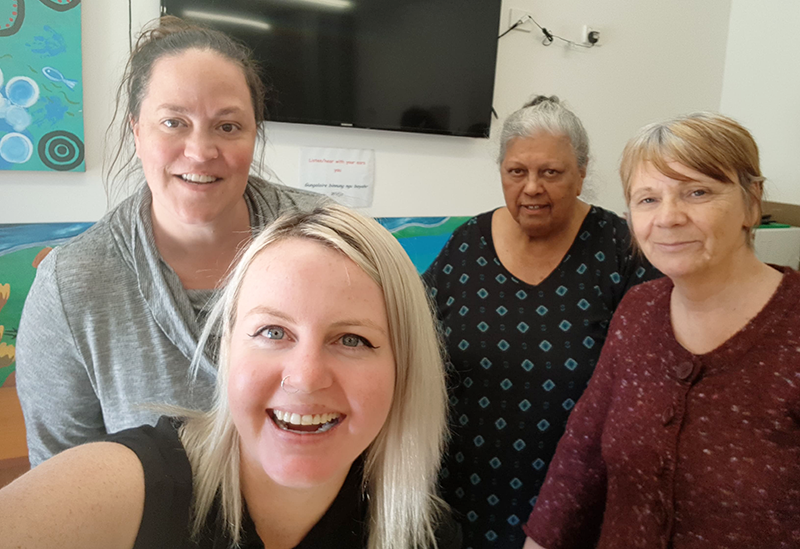 Since the Project has been rolled out, Northern Rivers Community Legal Centre has seen an increase in referrals from service providers in early intervention care and protection matters. The increase in referrals has led to families being assisted to understand their rights and responsibilities and to more effectively navigate the child protection system. Veronica contacted Northern Rivers Community Legal Centre for advice after NSW Police officers attended her home to complete a welfare check on her two children. The police told Veronica that they had received reports that she had been smacking and yelling at her children. We gave Veronica advice about the process of reports being made to FACS if children are considered to be at “Risk of Significant Harm”, including what to do if FACS make contact with her in relation to the children. Three weeks later Veronica came back to us for further advice. FACS had made contact with her and asked her to attend a meeting to talk about the children, which Veronica didn’t want to attend, or to engage with FACS at all. the importance of engaging with support services. We arranged for a support worker to attend the meeting with Veronica to assist her with note taking. Veronica attended the meeting and followed our advice with regard to positive engagement, insight and protective behaviours. Following this, the outcome of the safety assessment was ‘safe’ and FACS referred Veronica to a family support service for ongoing support. Veronica sad that she wouldn’t have engaged with FACS if she hadn’t had legal advice. During the course of the Early Intervention Referral Project sector development sessions it became apparent that ongoing and sustained community education was required in utilising the referral tools. This was not only to assist clients overcome the barriers they experience in accessing early intervention legal services, but also to address the barriers that service providers have in referring clients to legal services. Service providers working with families often reported to us that they did not refer clients to legal services because families already had enough to do in regards to FACS requirements and that service providers were reluctant to refer to legal services if they themselves were the mandatory reporters. Above: Charlotte Buckton; Auntie Nancy Walke (Bunjum Aboriginal Corporation); Zoe Deray (Child Protection Solicitor from the Aboriginal Legal Service); and Karin Ness. As the project has evolved, we have developed a greater awareness of the potential of the Early Intervention Referral Project map as a tool for assisting service providers to facilitate early access to legal services for their clients. The Project has been funded by Legal Aid NSW’s Cooperative Legal Service Delivery program since its inception and a small amount of new funding to continue sector development has been promised for the next eighteen months. The Project’s sector development sessions will place a greater emphasis on discussing and documenting the barriers to accessing early intervention legal services for service providers and families and identifying and documenting strategies to better facilitate access to child protection early intervention legal services. 1. Suzie Forell ‘Is Early Intervention Timely?’ Law and Justice Foundation of NSW, Issues Paper No.20, August 2015. Suzie Forell, Is Early Intervention Timely? (Law and Justice Foundation of NSW, Issues Paper No.20, August 2015). Tamara Walsh and Heather Douglas, 'Lawyers, Advocacy and Child Protection', Melbourne University Law Review 35, no. 2(2011), 621. Supporting parents with intellectual disability in care and protection proceedings project: review report (Intellectual Disability Behaviour Support Program, University of NSW, February 2017). Child protection: engaging with parents (Parenting Research Centre, August 2017). Improving Outcomes Together: Summary of Their Futures Matter Conference 2019 (NSW Government, February 2019). Roadmap for Reform: Strong Families, Safe Children (Department of Health and Human Services Victoria, May 2018).